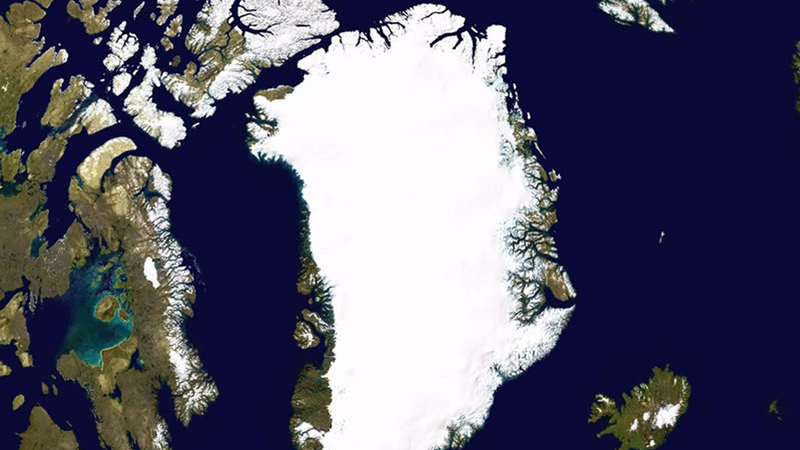 Dr. Alexander Robinson from the Universidad Complutense de Madrid and the Potsdam Institute for Climate Impact Research (PIK) have produced a new model that indicates the Greenland Ice Sheet might be more vulnerable to climate warming that previous estimates predicted. What’s noteworthy aobut the study, published in Nature Climate Change, is that the ice sheet might melt away – albeit over a very long timescale – even with a very small rise in average global temperatures compared to pre-industrial levels. 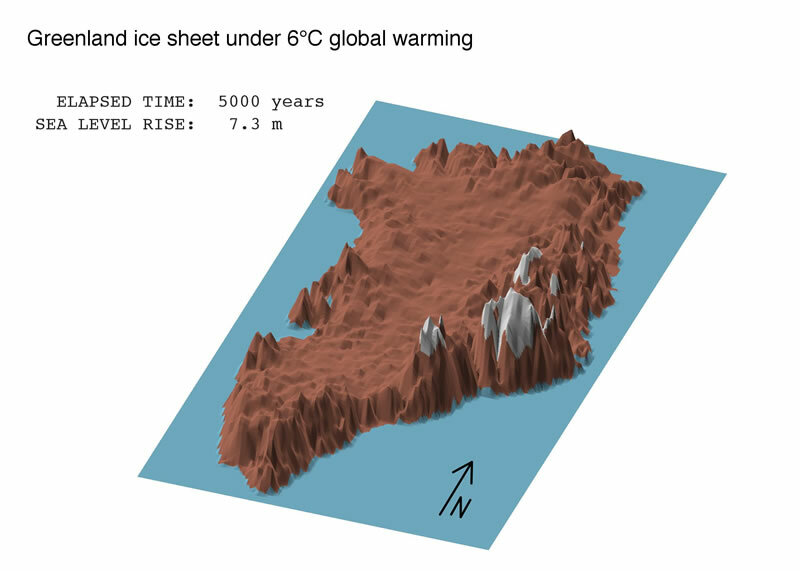 The model shows that above a threshold of just 1.6°C of warming, the Greenland Ice Sheet could melt completely away – although over a very long timescale of about 50,000 years. However the model also shows that if temperatures were to get significantly warmer than the threshold, the amount of time it would take for the entire ice sheet to melt becomes drastically less. In this second part of his interview with SciencePoles, Dr. Robinson discusses different melting scenarios for the ice sheet, what it could mean for sea level rise, how improvements could be made to his group’s model, and what the model’s findings mean for policymakers. According to your model, even keeping to the limit of 2°C average global warming above pre-industrial levels the IPCC recommended in its 4th Assessment Report would still mean the Greenland Ice Sheet melts away completely, although over a very long time period. Yes, and that’s the critical point of the study. We tried to precisely map where this threshold was, and our model shows a median warming of 1.6°C above pre-industrial levels. And that’s not saying how long it takes to reach a new equilibrium state. If you’re right below the melting threshold, it’s never going to melt, and if you’re just above it, it’s going to take a very long time to reach an ice-free state. But if you consider warmer temperature scenarios – like what we will be facing over the course of the 21st century – the timescale for complete melt gets shorter and shorter. And it doesn’t happen in a linear way. With 2°C of warming, it would take 50,000 years for Greenland to reach an ice-free state. But with 4°C of warming, it would take only 8,000 years. What do you mean when you say melting won’t happen in a linear way? I mean that the amount of warming doesn’t correspond to a proportional amount of change in the timescale over which the melt happens. With 2°C of warming, it takes about 50,000 years for the ice sheet to melt. But if we go up to say, 8°C of warming, then the whole ice sheet is gone within 2,000 years. The melt happens at a rate an order of magnitude faster with only a few degrees more of warming. At some point, the ice sheet gains some inertia, and under warmer and warmer temperatures, it equilibrates to the new forcings faster and faster and the melting accelerates. How might this melting affect sea levels? If the entire Greenland Ice Sheet were to melt, it would lead to a little more than 7 metres of global sea level rise. With 8°C of warming, you lose about 20% of the ice sheet in about 500 years, which would correspond to about 1.5 metres of sea level rise, or an average of 30 cm per century. As melting accelerates, so does sea level rise. But we have to remember this estimate is from a model that doesn’t include any acceleration in outlet glacier flow or lubrication of the base of the ice sheet from melt water, which could enhance ice loss even further. Our model is simply a base estimate looking at how fast surface melting will cause the ice sheet to disappear. You’d need to look at glacier discharge and basal lubrication to get a better estimate of exactly what sea level rise will be over a given period of time. What kind of improvements, if any, would you like to make to your model? We’re quite happy with what we’ve been able to produce so far, and it’s proved very useful in its current state. But I think there are several things we can do to improve the model so it can include more processes, especially regarding surface energy balance (the transfer of energy between the climate and the ice sheet), while maintaining a computationally efficient model. If we can do that, hopefully we’ll be able to refine our estimate. Right now we have a range of uncertainty. It would be nice to be able to constrain that range a bit better. There have also been a lot of advances in regional climate modelling for Greenland and its surroundings. This provides a lot of data with which we can tune a new model that includes additional processes. The hope would be to improve our estimates and also explore how the Greenland Ice Sheet evolved in the past. Has your model been able to accurately model past behaviour of the Greenland Ice Sheet? Yes, it does…as far as we know about what it was doing in the past, which isn’t very much unfortunately. We have data from ice cores taken from Greenland, which helps us constrain the models to an extent. During the Eemian Period – the last interglacial period before the current one, which began about 130,000 years ago and ended 114,000 years ago – climatic conditions were similar to those of today. We have some data about how the elevation of the summit of the Greenland Ice Sheet changed. It appears that the summit might have dropped 300-400 metres over the course of the Eemian. So we can see how the ice sheet evolved under temperature forcings during this warm period, and we can say the only models that are valid are the ones that can reproduce a summit reduction of 300-400 metres. So essentially we used paleoclimate information along with information from the present day about surface mass balance and how ice is currently distributed over the ice sheet. This gave us a rough idea of how to constrain the model. But estimating past changes in the ice sheet is very difficult. There’s still a lot of uncertainty. For example, our model estimates that Greenland Ice Sheet volume loss during the Eemian was between 1 and 4.4 metres of sea level equivalent. That’s a very wide range. All simulations in that range are consistent with the information about that time period we have so far. Are current estimates going to be revised further before the next IPCC report is released in the next few years? That’s a good question. From our side, I think the model we’ve just put together will be the last one we’re able to do before the next IPCC report comes out in 2014. The deadline for submitting findings is in June 2012. So this will be our group’s contribution to the next IPCC report. But what ends up in the report also depends on what other modelling groups are doing. What are other groups looking at Greenland doing? There are a number of groups modelling the Greenland Ice Sheet. But I don’t think there are many groups modelling the long-term evolution of the ice sheet in response to climate warming like we’re doing. We’re one of the few groups using an intermediate complexity approach that we developed specifically for modelling Greenland over long time scales. Some other groups are working on similar approaches, but I think a lot more groups are concentrating on the short-term – what will happen to Greenland in the next 100 – 300 years. For that kind of modelling, you need a much more complex approach than our model uses. But these processes are important to model because in the next few hundred years, fast processes will play a major role in what happens to the ice sheet. It’s important to be able to represent those, and we simply can’t represent these processes with our model. 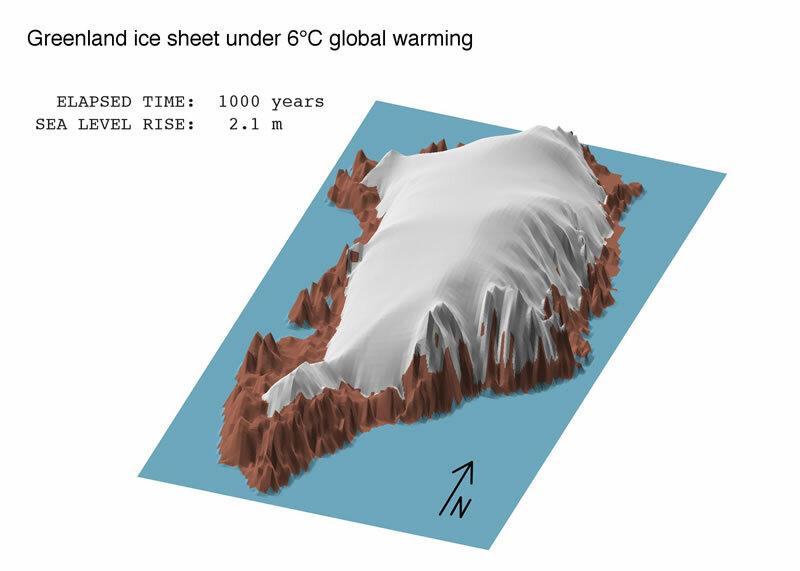 What about modelling other land ice – mountain glaciers and the Antarctic Ice Sheet? Where are we with them? There’s a lot of detailed modelling of mountain glaciers going on. If you’re modelling a particular mountain glacier, the domain is much smaller (glaciers aren’t that large), so you can run a much more advanced model with less computational costs. What implications does your study have for policymakers? Our main goal was to understand the sensitivity of the Greenland Ice Sheet to climatic changes and to provide a threshold range above which the ice sheet would start melting. In some cases, the mass loss could become irreversible. We tried to present this information as clearly as possible. What our study means for policymakers is that humans can have a very large impact on the planet, and if we do cross this temperature threshold, it will be very hard to come back from it. We still don’t have any way of rapidly decreasing CO2 levels in the atmosphere. Once temperatures increase, it will be a very long time before temperatures decrease again, and this will allow a significant portion of the Greenland Ice Sheet to melt in the meantime. Right now we’re on track to have something like 6°C – 8°C of warming over the next century, which is more than enough to put the ice sheet on an irreversible path towards melting. This implies that sea levels will be continuously increasing over the next several centuries and even millennia as the ice sheet melts away. If the current committed reductions from different countries around the world come into effect, we would reach only about 3.5°C of warming by 2100. This is still far above the melting threshold. But the melting would still occur over a long time scale. So from there you enter into a grey area whether that kind of warming and its consequences are acceptable on human timescales.